Has the dust settled in Richmond after the Tigers won the 2017 Premiership flag ? The Richmond Tigers gathered momentum to crush the Adelaide Crows in a decisive victory. Jubilant fans partied the night away and Swan St was awash with celebrations. Whilst the Crows are a slick, professional football machine, the sentimental favourites, the Tigers skilfully applied tremendous pressure to outman the Crows and gain victory. 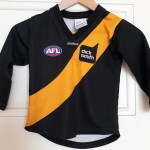 Fans country wide were celebrating the victory in their yellow and black football jumpers, jerseys, guernseys. The Crows football jumpers, jerseys, guernseys have been rested temporarily whilst those fans muse on the loss of the 2017 Premiership Flag. 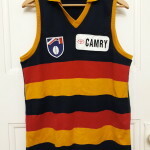 This entry was posted on Wednesday, October 4th, 2017 at 5:29 pm	and is filed under football guernseys, football jerseys, football jumpers, footy, Richmond Tigers, Tigers. You can follow any responses to this entry through the RSS 2.0 feed. Both comments and pings are currently closed.